The Soils in Bahariya Oasis are promising for land reclamation projects due to their location and availability of groundwater resources for crop irrigation. 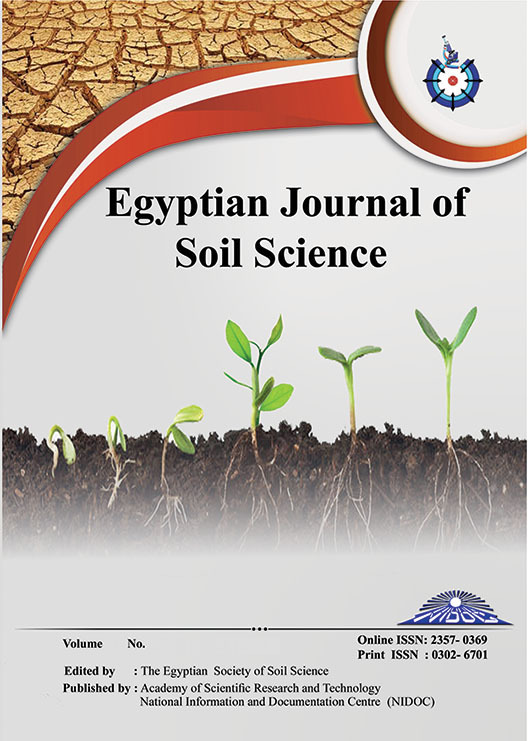 The objectives of this work were to evaluate land capability of soils in Bahariya Oasis and to make an assessment of their suitability for certain crops. For this purpose, 31 geo-referenced soil profiles were dag, field described and classified. Also, 68 soil samples were collected from these profiles and analyzed for their physical and chemical properties. Water samples were also collected from irrigation wells and analyzed for their chemical quality parameters. Land evaluation was carried out using the Agriculture Land Evaluation System for arid and semi-arid regions (ASLEarid). The obtained results indicated that soils in Bahariya Oasis were located into three capability classes, which are good (C2), fair (C3) and poor (C4). The first class (C2) was represented by only one soil map unit (SMU10). Soils in that SMU have fair soil index (SI) and low soil fertility index (SFI). The second class (C3) included most of the studied SMUs (2, 3, 4, 5, 6, 8, 9 and 11). Soils in that class have poor to fair SI and SFI. The third class (C4) included SMUs 1 and 7. Soils in that class have poor SI and SFI. Poor land capabilities were found to be associated with poor soil texture, high salinity, low available water, high hydraulic conductivity and low fertility. However, these limitations are not permanent and most of them can be improved through proper management practices. Land suitability for the selected field crops showed that wheat, sunflower and alfalfa were highly (S1) to conditionally suitable (S4), whereas barely, peanut, maize, faba bean and sugar beet were moderately high (S2) to conditionally suitable (S4) in all SMUs. On the other hand, the selected vegetable crops showed that tomato and watermelon were highly (S1) to conditionally suitable (S4) and onion, pea, pepper and potato were moderately high (S2) to conditionally suitable (S4) in all SMUs. The selected fruit trees ranged from highly suitable (S1) to actually unsuitable (NS2) with date palm and fig, whereas olive, grape, citrus and pear ranged from moderately high (S2) to actually unsuitable (NS2) in most of the soils. Non-suitable areas were due to soil depth restrictions and high salinity, which can be modified through appropriate management practices.